Built with strict HP standards and guidelines, this world-class HP Wireless Mouse X3000 effortlessly blends sleek, modern design with life-enhancing, advanced features. 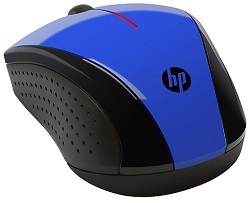 The sleek and modern HP Wireless Mouse X3000 adds an instant touch of trend-setting style to any work space. Glossy black and metallic gray shine with sophistication. Plus, its curvy silhouette gives it a seductive shape. Lets you easily access media and manage content - including read, write, copy and card-to-card copying.